You’ve already seen this outfit. It’s what I’m wearing on the giant billboard you’ll see at SM Mall Of Asia once you visit its end of season sale (which explains my thick makeup here). Sigh, I still get so kilig whenever I see that billboard! I think a lot of you probably already know how much I LOVE blazers. I always include them in my list of fashion must-haves whenever I’m interviewed. A type of blazer that’s very close to my heart are boyfriend blazers. They’re one of my ultimate favorites. Extra points if they have pockets! I just love the masculine appeal boyfriend blazers exude. I usually wear them with dresses or bottoms that are either too short, too thin, or too tight so aside from protecting me from peeping toms, they balance off my feminine outfits and add a hint of sophistication to my lazy wear too! Who knew Dickies has so many cute socks like these??! omg camille!!!! you look uber good! :) minus the make-up but still, you are mesmerizing! Try please :)))) MINI loves adventures! Thanks Charisse! :) Nako, let’s dream haha! Those socks are sooo cute. Love the pink heels too! I was thinking about using this dress for my rehearsal dinner. The material is nice, the pockets are awesome! But i felt like the dress wasn’t quite what I was looking for. I need a little more wow. I agree! :) You have to look extra special! I love this look a lot! The makeup works perfectly because its such a sweet outfit and the make up brings a mature edge to it. Love the dainty look! The rings, shoes with socks… All of it, I love it!! Hi Ms. Camille! How would you style a blue peplum dress? I will be attending a friend’s graduation. I love this outfit of yours especially the blazer. and the dress is also beautiful. is there already a winner on the Pin to win contest motilo.com blah..?? have a nice day!! Your look is too cute, so sweet. I really love the shoes and socks too! New Hair, and you wore already red lipstick hah?!! I thought it was a dress.. Ohh, the illusion that you make.. 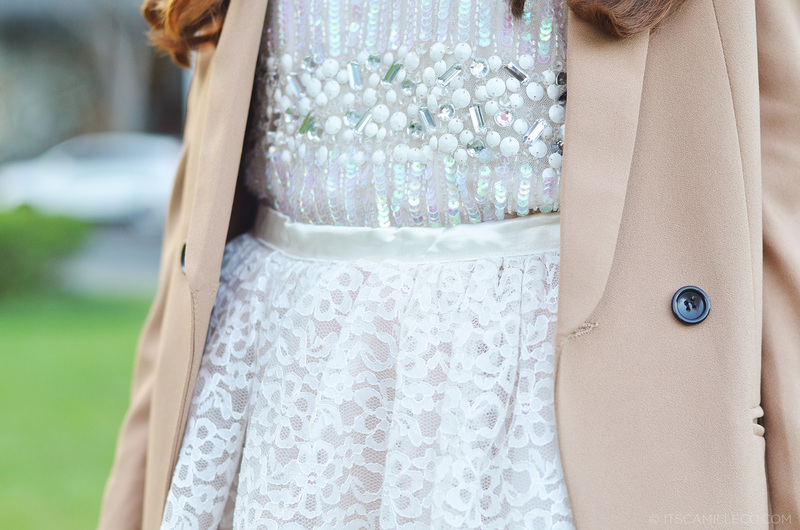 I love the beaded top and that blazer is everything! I don’t live in Asia so this is actually my first time seeing this look. It’s really cool that you are on a billboard, walking in the mall and seeing yourself. I am not too big on socks but those are adorable! You make chic look so effortless! And the shoe and socks pairing is so cute! aww really love this look! has to be one of my favourites! never really thought of purchasin’ a brown blazer either, and the socks are so pretty! Thanks Pat! Happy new year! Camille may question lang panu ba magkaron sa blog ng follow me button? (Follow me: twitter, lookbook, bloglovin and chictopia). natutunaw na utak ko eh.. di ko magawa. hehehe! Thanks Ish! Love the fit too! This look is so elegant! Plus love the socks! You are soooo pretty =))) I love the outfit! In love with your dress !! Your outfit is very pretty buy your eye make up let it down. Its too heavy for this kind of dainty outfit. You should choose lighter colour of eyeshadow. You look prettier with natural make up. Although I know its for a photoshoot, but during this regular outfit shoot, it make ur eyes smaller and un-natural. Better next time Camille! super love cams,…you tone down a bit all those cute-girly look by adding a blazer on. This outfit is so gorgeous! I love the top and skirt, it looks like a dress. I just love how dynamic ur style is!